Only one of the six statewide office-holders lost their re-election bid this year. Democrat Rob Sand, an aggressive fundraiser and campaigner, unseated Republican State Auditor Mary Mosiman. Sand, who has been a prosecutor in the attorney general’s office, struck a bipartisan tone in his victory speech. Secretary of State Paul Pate, a Republican, won a third, non-consecutive term. Pate spoke to the crowd at Iowa GOP Election Night headquarters last night. Pate mentioned the pending legal challenges to the recent changes in Iowa election law. Mike Naig, a Republican, was appointed state ag secretary this past March. Voters gave him a full, four-year term in the post. He also celebrated with supporters at Iowa GOP Election Night headquarters. “We worked hard and I’d like to think we ran for the right reasons,” Naig said. Naig promised to focus on three key issues. Democrat Mike Fitzgerald won a 10th term as state treasurer. Early next year he will become the nation’s longest-serving state treasurer. Another Democrat, Tom Miller, won a 10th term as attorney general. He’ll hit his own longest serving ever national title in 2020. 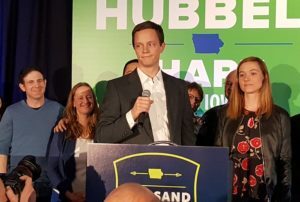 The other statewide officeholder is Republican Governor Kim Reynolds, who also won reelection last night.